Messi wins it for Barca again! A late goal from Lionel Messi enabled Barcelona to emerge with a hard-fought 2-1 victory over Atletico Madrid on Sunday afternoon at the Estadio Vicente Calderon in Madrid. 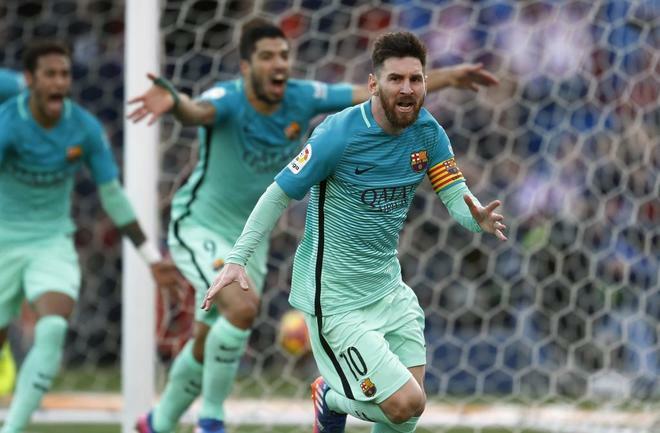 Following goals from Rafinha and Diego Godin earlier in the second-half, Messi struck in the 88th minute to give the Catalonians a huge three points. Barcelona momentarily sit atop the La Liga table with 54 points, two points ahead of Real Madrid and Sevilla, with Real in action later on Sunday. Los Blancos also have a game in hand. For Barcelona, the win should do wonders for their confidence. Coming off the heels of their disastrous 4-0 Champions League loss to PSG and their unconvincing 2-1 league win over Leganes, Luis Enrique’s men needed a positive performance and result on Sunday. The recent struggles of Andre Gomes paved the way for Rafinha to get the nod in midfield in Luis Enrique’s starting XI, while the other notable move was in defence, as Jeremy Mathieu started ahead of usual left-back Jordi Alba. Meanwhile, Jan Oblak was back in goal to complete a full-strength starting XI for boss Diego Simeone. Right from the kick-off it was evident that Luis Enrique’s tactics had changed from the previous week. The Asturian had Barcelona playing in a 3-4-3 rather than the 4-3-3 that he normally deploys in an attempt to have better control of the midfield. When in possession Barcelona were deliberate, content to let play develop and wait for a chance. Consequently, Atletico stayed compact in defence, clogging the Barcelona passing lanes or swarming the middle when a ball was played into Andres Iniesta, Sergio Busquets or further ahead to Messi. Barcelona’s three-man defence experienced some shaky moments at the start. The Rojiblancos were finding space when attacking on the counter and if not for some bad touches in the final third or some last-ditch defending from Gerard Pique or Samuel Umtiti, Atletico would have had a goal in the first-half. scramble, but replays confirmed referee Mateu Lahoz’s ruling that the Uruguayan had fouled Oblak. The match opened up and each side had a good look at scoring before intermission. Ter Stegen rose to the occasion to snuff out an Atletico chance, diving to smother a Griezmann cross before it could reach Koke. Meanwhile, Oblak showed he could match Ter Stegen’s heroics as the tall Slovenian soared to his left to paw away a dangerous Messi free kick. Moments later Oblak was called into action again to save a Pique header off a corner kick. Suarez could only stare in disbelief after failing to capitalise on a chance at the start of the second-half. Neymar played into Messi, who fed Suarez in on goal with a quick pass, but the former Liverpool man’s shot was woeful, rolling a few feet wide of the far post. Ter Stegen was just as busy to start the second half as he was to end the first. The German came up big to save a Griezmann shot after the French striker had raced past Umtiti following a fine through pass from Saul. Barcelona began having their best moments of the match after withstanding Atletico’s early second half pressure and their insistence paid off handsomely just after the hour mark. After attempts from Suarez and Neymar, a rebound of a deflected Messi shot fell for Rafinha, who turned and fired into the Atletico net to give Barcelona the scrappiest of goals but also a 1-0 lead. But if there is one weapon that has served Atletico well in big matches under Simeone, it has been Godin on set pieces and minutes later the Uruguayan defender came through again to pull the hosts level 1-1. Koke swung in a free kick from the left and Godin, between two Barcelona defenders, sent in a glancing header that beat Ter Stegen. It was anyone’s match heading into the final quarter-hour with both teams fighting for every ball as if it was the last. But on this day, in a match of such great importance, only one man could be the deciding factor: Messi. 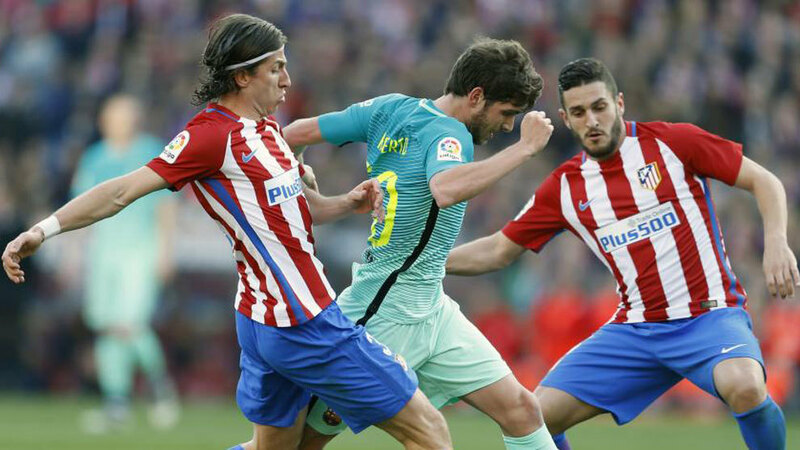 Like the first goal, the Atletico defence were unable to clear danger initially and Barcelona took advantage. 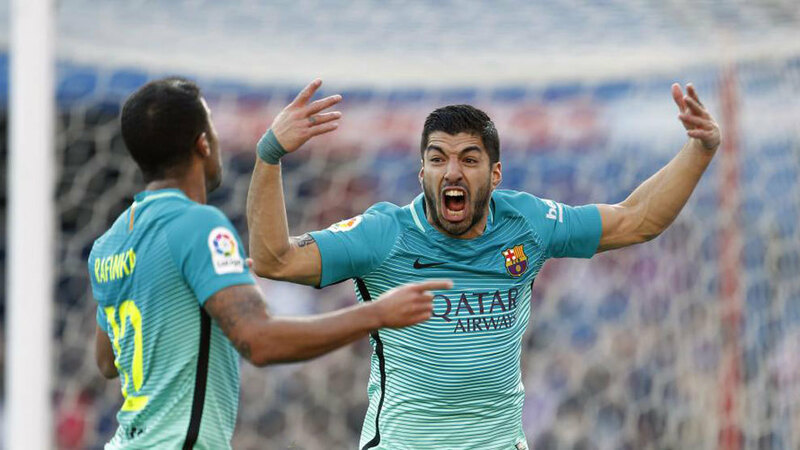 Suarez found Messi unmarked in the area and after an initial block, La Pulga collected the rebound and scored to silence the Calderon and give Barcelona a massive three points. Barcelona return to league action on Wednesday at home against Sporting Gijon. 2.- FC Barcelona: Ter Stegen; Sergi Roberto (Andre Gomes, min. 85), Pique, Umtiti, Mathieu (Digne, min. 77); Busquets, Rafinha, Iniesta (Rakitic, min. 72); Messi, Suarez, Neymar.